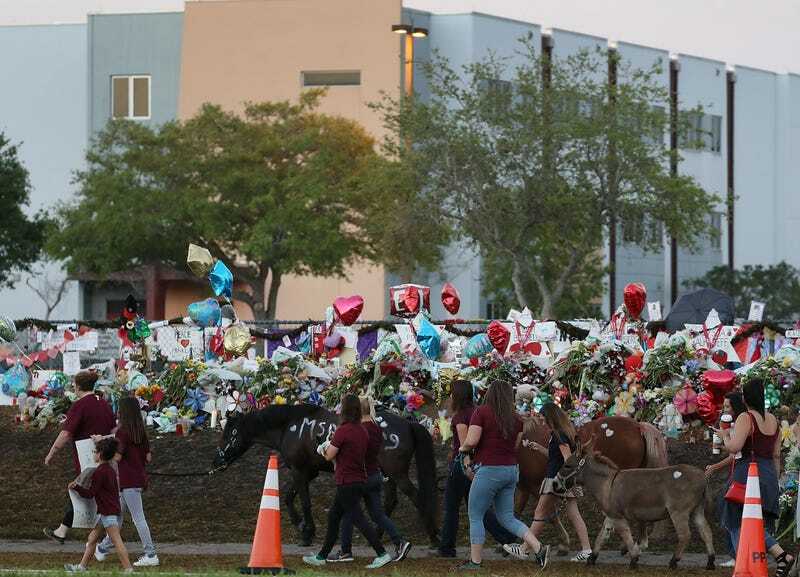 People arrive to offer support at Marjory Stoneman Douglas High School in Parkland, Fla., on Feb, 28, 2018, as students arrive to attend classes for the first time since the shooting that killed 17 people on Feb. 14 at the school. As teachers, parents, students and Parkland residents voiced their opposition, Florida lawmakers advanced legislation Tuesday that would create a statewide program to put armed teachers in classrooms. The Miami Herald reports that the state House Appropriations Committee voted to approve a measure that would see teachers trained to carry guns in the classroom under the supervision of local law enforcement as long as superintendents or the school board approves. A similar bill approved by the Senate Appropriations Committee requires that both the sheriff and school district officials agree to the program before it can be adopted. “The last line of defense would be a highly trained person in the school,” Rep. Jose Oliva (R-Miami Lakes) said, referring to teachers with guns. The “school marshal” program, which is written into both H.B. 18-06 and S.P.B. 7027, would cost $67 million—most of which would be spent on training. The bills would also raise the age to purchase a gun from 18 to 21, impose a three-day waiting period, and give police more power to take guns from people who threaten themselves or others. Olive told the Herald that he didn’t know if teachers would be provided guns or would have to buy them, but said that the House plan does provide a one-time $500 stipend for those who volunteer to have a gun. State officials would like to see 10 marshals in every school for a total of 37,000 in the state. “The state would cover the costs of background checks, drug testing, psychological exams and the 132 hours of training,” the Miami Herald reports. All of the components of the plan would require $400 million to implement, including the $67 million to fund the marshal program, $100 million to increase mental health assistance in schools, $75 million for “safe schools,” $90 million to make school buildings more secure, and about $25 million to create crisis and action teams at the Department of Children and Families. There will also be a budget of $1 million used to create a permanent memorial at Douglas High School, as well as $225,000 to cover the death benefits of three school staff members who lost their lives in the Feb. 14 shooting.